Weekend Reading: Death from the Morgan Greer. Could there be any more appropriate card for the year end? 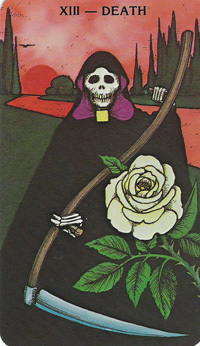 The Death card comes to speak of endings and new beginnings. Anytime you want to bring something new into your life, as you may do with your New Year's resolutions, you have to let go of the old way of being. That's the message Death brings...that's it's time to shed your old ways to make room for fresh new growth. So as you consider what you might want bring into being in the New Year, consider also what you need to let go of in order to make that happen. And honor the letting go. Whatever it is, it's something that once served you and it deserves respect.